When it comes to telling your story, only you know exactly what’s best for you. Your creativity is your craft, your vision is your voice, and your unique experience is the ingredient that brings it all together. But to set yourself apart, you need a storytelling platform that combines eye-catching design with the latest tools for encouraging reader engagement. 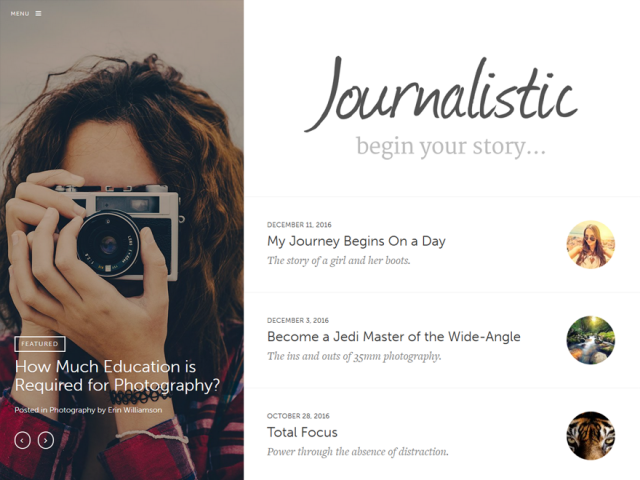 That platform is Journalistic, a fully updated WordPress theme designed by UpThemes for immersive, show-stopping storytelling. Formerly known as Largo, Journalistic builds upon its predecessor while standing on its own as a completely updated release. After reviewing and reworking Largo down to the last detail, we’ve fallen in love Journalistic’s combination of versatility, functionality and beauty. And now, we’re pretty sure you will too. 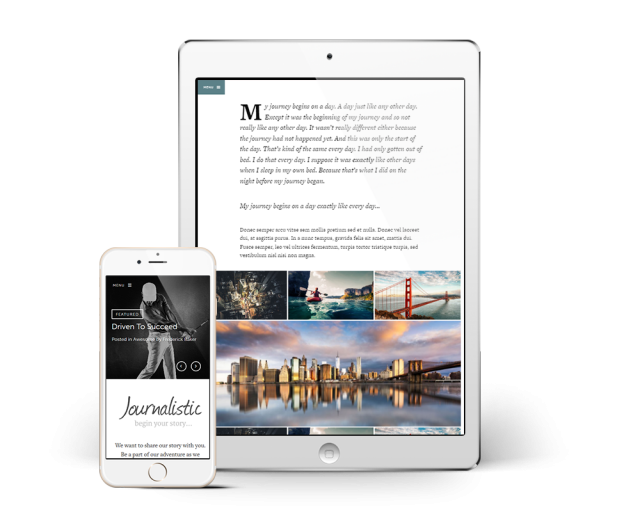 Powerful and dynamic, Journalistic helps you build a visually stunning website that provides a truly immersive experience for your readers. More than just a pretty face, Journalistic perfectly balances form with function to get you the most out of your creative content. And as always with UpThemes, you know you’re getting an awesome, easy-to-use theme that never compromises on quality. So what do we like best about Journalistic? Here are a few of the highlights. Journalistic keeps your conversations flowing with the innovative contextual power of inline commenting. Unlike traditional comments, inline commenting allows readers to respond to a specific passage or paragraph for a more meaningful discussion. If you want to keep comments at the end of your articles, Journalistic lets you do that, too. You decide. What’s more, Journalistic’s infinite scroll feature lets readers browse a continuous supply of content so they can keep exploring indefinitely. 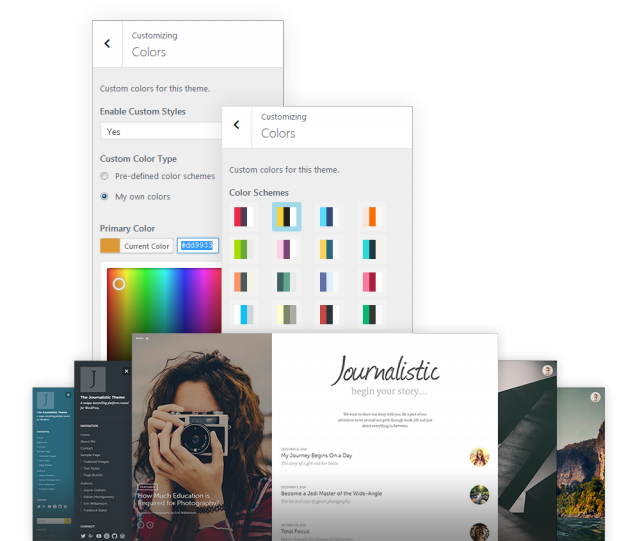 Imagine: A small business with blogs for every employee, each with an individualized design full of custom colors and imagery. Thanks to Journalistic, your brand maintains a uniform look and feel while still giving your employees plenty of room to showcase their individualism. But Journalistic isn’t just a tool for businesses. With its flexible design options, including 19 unique color schemes, it’s also ideal for personal blogs, portfolios, longform stories or any other format you can dream up. With you at the controls, the possibilities are endless. 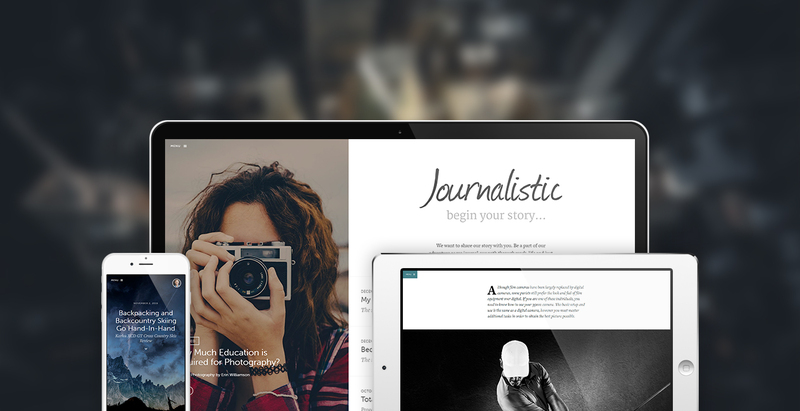 Journalistic features expanded integration with the AESOP Story Engine, which is great news for you and your readers. With dynamic capabilities like parallax effects, content overlays, chapter-based storytelling and timeline-style page navigation, you’ll be able to create show-stopping content quickly and easily. And that’s just to name a few of Journalistic’s powerful AESOP-based features. Simply type in your text, add your images and let AESOP do the rest. With less time and effort spent on fine-tuning your design, you’ll have more time to engage with your readers. Drag and Drop: With the popular Beaver Builder plugin, you’ll have unlimited potential to create exactly what you want. Stunning, Mobile-Friendly Design: These days, it’s not enough for your site to look beautiful on a traditional computer screen. That’s why our themes give your readers the same stunning design on all their devices. And with Journalistic, you have 19 unique color schemes to work with—five more than the original Largo release. Typekit Fonts: Journalistic comes with gorgeous Adobe® Typekit fonts baked right in. 1-Click Demo Install: With a single click, you get all your theme settings, widgets and default WordPress configurations. Optimized for Social: Place your social media links directly into the theme to drive traffic to all your social channels. Speaking Your Language: No matter what language you speak, UpThemes has you covered. Journalistic supports right-to-left text languages and localizes all text for easy translation or multilingual sites. Side Navigation: Customize your logo, title, menus, colors and widgets in our slide-out navigation tool. Full-Screen Headers: Optional full-screen header images jumpstart your posts with a memorable visual. Light, Fast, Commented Code: Love to tinker? We’ve made it easy with detailed comments in our lightweight, easy-to-read code. Support and Updates: At UpThemes, we keep our customers satisfied with detailed online documentation, an extensive library of video tutorials and responsive professional support. Plus, we provide quick and easy updates directly to your WordPress dashboard. With a single click, you can automatically update to the latest version instantly. Or, get started building your site now! First, of fall I will thank to Andy Wilkerson to share information with us. WordPress really a wonderful platform easy to develop a page and easy to handle. That’s why WordPress development company demand increases day by day. WordPress web development cost chip according to another platform.